Making charming Christmas ornaments for the entire family can be a simple as printing, cutting and gluing on some glitter! 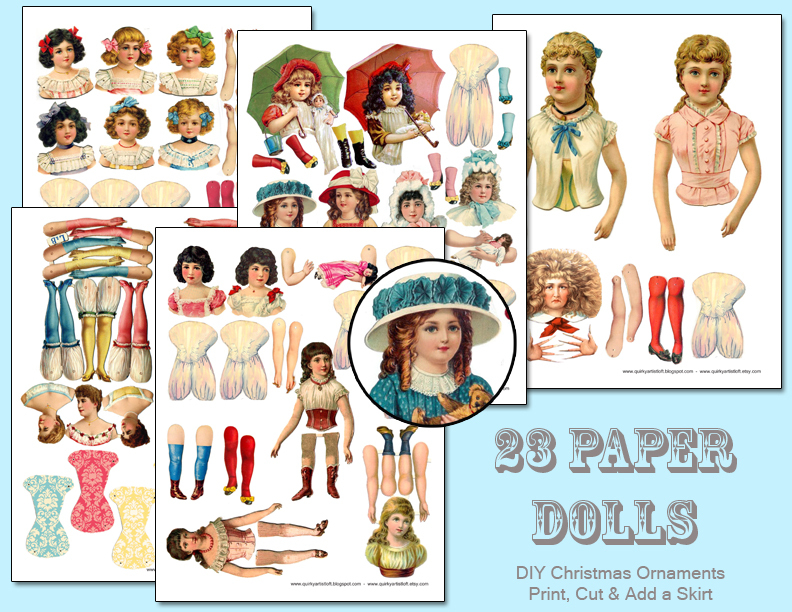 I've collected some adorable vintage Victorian paper dolls, and digitally resorted them, removing stains, rips and bends. These dolls are the perfect size for the Christmas tree, with the exception of the larger girls which would be great for a wreath or table centerpiece. The also make great homemade toys for children. The arms and legs are attached with miniature brads, I found mine at 'Michael's Craft' (unfortunately Walmart and the dollar stores did not sell them). Use feathers, sequins or anything else you can find to embellish your dolls. The skirts are extra wide ribbon or lace. I loosely sewed the ribbon to gather it, then hot glued it on. Some home printer ink can run when it gets wet, so for long term ornament use you can have the pages printed at a print sop on a lazer printer, or you can lightly spray your home print-outs with a few coats of "Workable Fixative" to seal the paper, and then apply Modge Podge or other sealers for a stronger finish. Workable Fixative is a clear spray (in the spray paint section of art stores) used to seal charcoal drawings from smudging in between work sessions. spray sealers for watercolor paper would work well also. 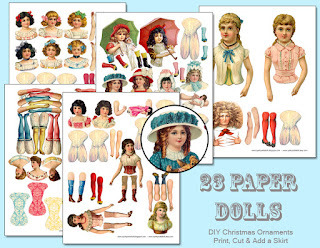 Click here to download a high quality 5 page pdf of these paper dolls.